A destination wedding can be an amazing event and a wonderful way to start your happily ever after. If you need to secure rental items for your ceremony or reception, however, it is best to do so early to be sure you don't have to hassle with missing or forgotten items in an unfamiliar place on your big day. Location – If your wedding is at a large resort that frequently hosts weddings, you may not need to rent as much. If you opt for a smaller location, however, you may be responsible to provide much more through renting. Size – Smaller weddings typically need fewer rental items, particularly if your location can provide basic items. If you have a larger guest list or more elaborate event in mind, however, you should be prepared for more rental arrangements. Customization – While many venues, including resorts or any location where weddings are popular, can provide basic equipment, you may need to rent items for any special requests you may have to make your day more unique. Glassware such as serving dishes for a candy bar, the cake stand, candle holders, etc. In general, the earlier you can reserve your destination wedding rentals, the easier it will be to confirm your plans and make any necessary adjustments. Reserving rental items 6-8 months before your wedding is recommended, but you may need to make reservations even earlier for very popular destinations, if you are having a very large event or if you have special requests that may be difficult to fulfill on shorter notice. When you set up your rental reservation, you may be asked for a ballpark estimate of your needs. While it is not necessary to have an exact headcount months ahead of your event, it is best to be able to tell the rental company whether you are planning for 50 guests or 500, as that makes a tremendous difference for rental logistics, contract negotiations and overall pricing. Your contract with the rental company will outline when a final count is required – usually ranging from just a few days to a few weeks before the wedding, depending on the company and their terms – as well as how final payments should be handled. 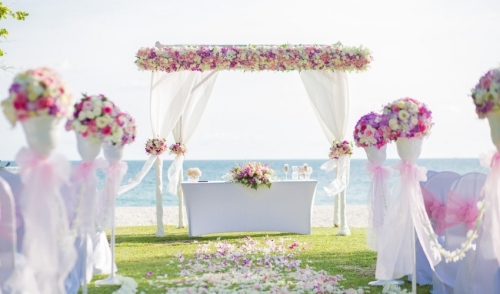 Consider working with a local wedding planner at the destination. They can help coordinate your rental needs and may be able to offer special deals and connections that can make it even easier, especially if there are last-minute complications. Be honest with your rental company, particularly about your budget, preferences and expectations. It is essential to find a company willing to work closely with you to create your special day, and they need to understand your needs to make that day happen flawlessly. Read your contract carefully to ensure you understand the terms of the rental agreement. This includes when payments are to be made, when headcounts are required and what penalties may be incurred if there are last-minute changes to the arrangements. If possible, plan a scouting trip to the wedding destination well before your event. This will help you envision how your plans may come together, and will give you a chance to coordinate with rental companies in person. Do not miss payment deadlines or you risk losing your rental reservation. Especially in the final weeks before your wedding, it can be difficult, if not impossible, to find replacement options that can work for your wedding preferences. Planning a destination wedding can be stressful, whether your wedding location is just a few hours away or halfway around the world. If you plan your wedding rentals early, however, you can be sure you have the time to make arrangements properly so your day will go as planned and will be the perfect start for many happy anniversaries to come.